Home » Coastal Uses & Impacts » Have You Seen a Fish Kill? 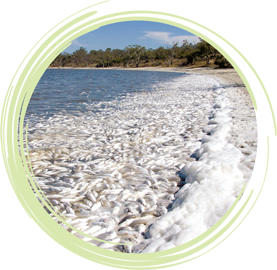 Fish kills in Australia and overseas have been recorded for thousands of years and are often the result of natural events. However, many are due to human impacts on the natural environment. Increasing population, poor land use practices and a drier climate have the potential to increase the frequency of fish kill incidents. Low dissolved oxygen in the water. Sudden change in physical water parameters. Further details about the above conditions can be viewed on the Fisheries website. Report it immediately to your nearest Fisheries office or Department of Water and Environmental Regulation office.